I happened to be in San Francisco this evening, and it was remarkable. It was one of those amazing Autumn evenings when it stays in the mid-seventies well after sunset. Usually tons of people would be out on such an evening, strolling with the sweeties, walking their dogs, and standing in long lines for ice cream. But it was darn near a ghost town. Was it the zombie apocalypse? No, everyone was in their homes and apartments, or at their favorite bar, watching a baseball game. It was the seventh game of the World Series, and the SF Giants were playing the Kansas City Royals. It was the bottom of the eighth, and SF was leading Kansas City by one run. I pulled the game up on my phone and tracked the ninth inning. Then it was the bottom of the ninth, Kansas City had two outs…and then I realized I could put my phone away and just listen. I’d be able to tell soon enough if we won. Sure enough, in a couple of minutes the screaming began. I literally heard the city begin to scream. Have you ever heard several thousand people screaming at the same time? It was impressive. Then the whistles began blowing, the horns began honking, the fireworks began going off all over town, and I even heard a train whistle that I swear was sounded in celebration by a local engineer who was a Giants fan. Congratulations, SF. Way to go! 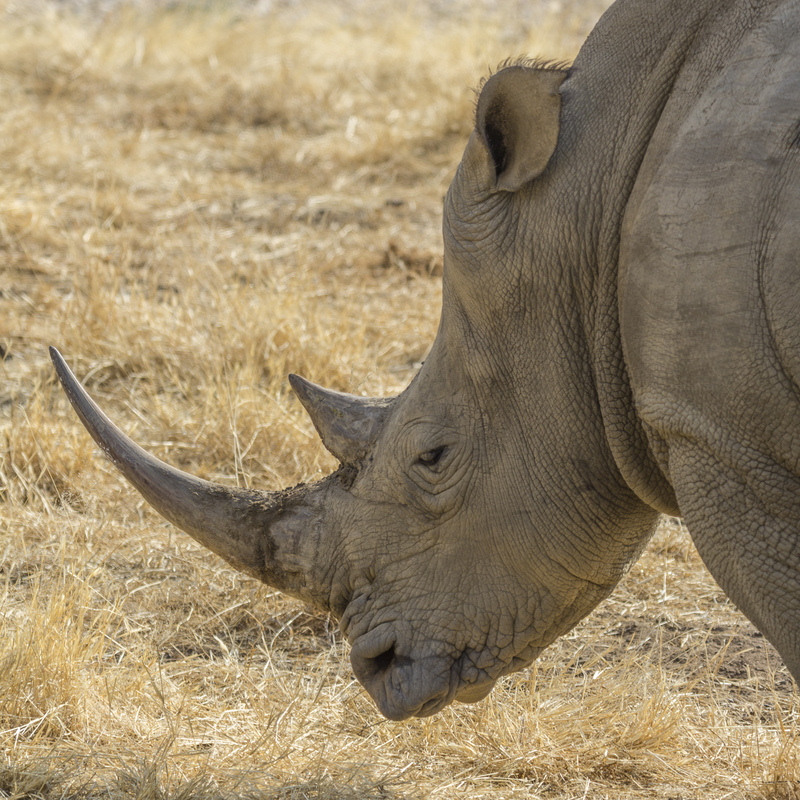 Rhinos will be better off without their horns…at least that’s what the Namibian government believes. They recently announced their intention to de-horn all the rhinos in Namibia to try to prevent poaching. I say TRY to prevent because de-horned rhinos are still poached. Yes, really. Sometimes they’re killed because it’s impossible to remove 100% of the horn with de-horning, so about 5-10% remains (maybe 1″-2″) and there are people who will still kill a rhino just to get their hands on that tiny stump. Sometimes they’re probably killed because a poacher takes a shot at them not realizing they’ve been de-horned, like if they’re spotted in heavy brush and the head isn’t clearly visible. And sometimes they’re probably killed just out of spite. Rhino horns WILL regrow after they’re sawed off, so the de-horning will not be a one-time occurrence, but will need to be repeated every year or two. De-horning isn’t cheap (several hundred dollars per animal), and it isn’t without risk to the rhino. Though the horn isn’t living tissue (think GIANT fingernail!) and cutting it off doesn’t hurt the rhino, the process of tranquilizing the huge beasts is dangerous to them. Some will die from a bad reaction to the tranquilizer, and that risk increases each subsequent time the rhino is tranquilized. And pregnant rhinos can’t be tranquilized at all. There are no easy answers to the poaching that kills hundreds of rhinos every year. 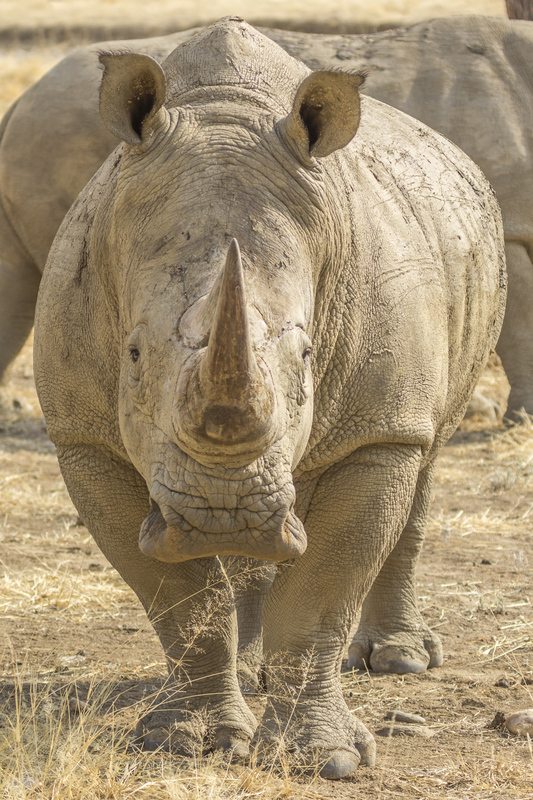 One distinct feature of the Southern White Rhino is its lips. Doesn’t it look like this rhino had an appointment with Angelina Jolie’s cosmetologist for some collagen injections? Those huge squared-off lips are designed for grazing on grasses (the rhino’s, not Angelina’s). Looking at the lips of a rhino is an easy way to distinguish a White Rhino from a Black Rhino, since neither species is literally white or black. Instead, both species can be grey or brown. Unlike their pouty-lipped White Rhino cousins, Black Rhinos have pointy, triangular-shaped lips that are designed for eating foliage, specifically for stripping the leaves off of twigs and branches. I’m endlessly amazed at both the big and small evolutionary modifications to different creatures’ anatomies that enable them to thrive in a particular environment! These two Southern White Rhinos decided to strike a pose straight out of a zoology textbook: Rhino A, anterior view and Rhino B, lateral view. One thing I love about rhinos is that they manage to simultaneously appear both fearsome and comical. Although every inch a mammal, to me they have a prehistoric, dinosaur-like appearance. 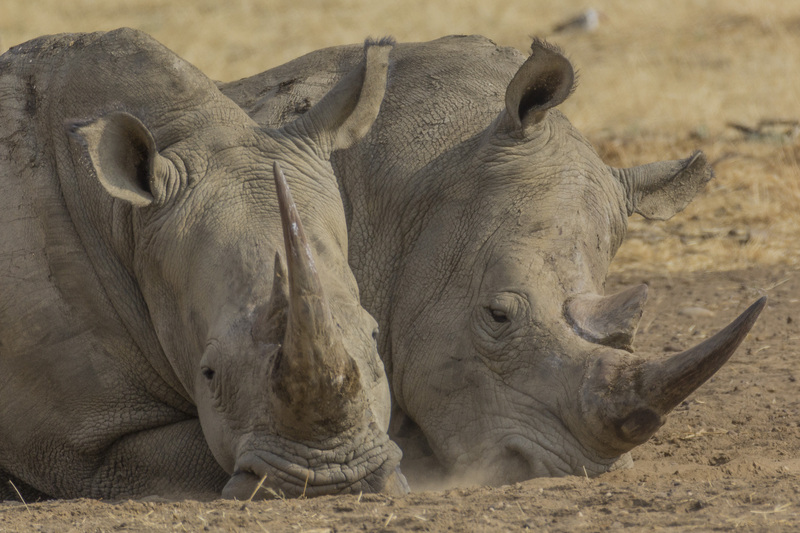 These two southern white rhinos (Ceratotherium simum simum) were hanging out together, lying side by side under a tree. You can see how their breath is stirring up the dust under their noses, but they didn’t seem to mind…they were lost in their rhino daydreams! 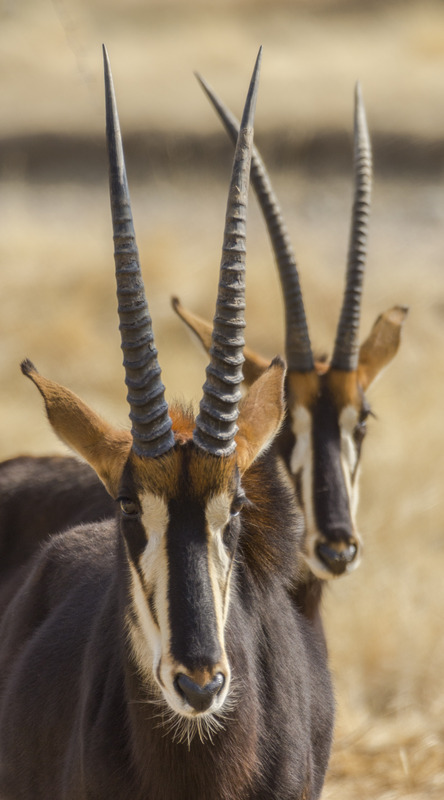 Two sables show off their formidable horns. Sable bulls use their horns to spar with each other over their harems of cows, but usually they don’t inflict much damage on their opponents. Sable calves are much lighter colored than the adults. If you look at the images of the adult sables from the last two days, you’ll see that they’re a very dark brown. But this calf is more auburn-colored, so that it blends into the grasses and brush better, because it doesn’t yet have the formidable horns of an adult with which to defend itself. Is it just me, or does this sable appear to be grinning? 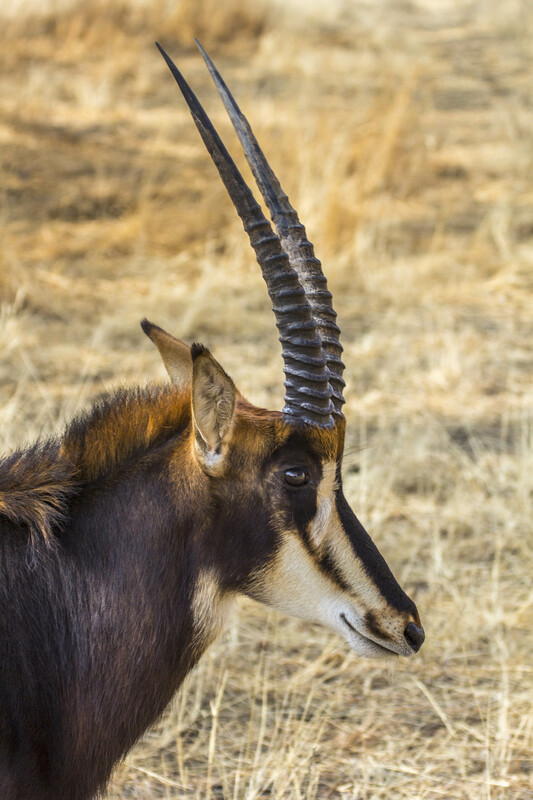 The sable antelope (Hippotragus niger) is a dapper beast. Their coats range from light brown to black, depending on the subspecies, and the calves tend to be lighter colored than the adults. A sable’s coat darkens with age. 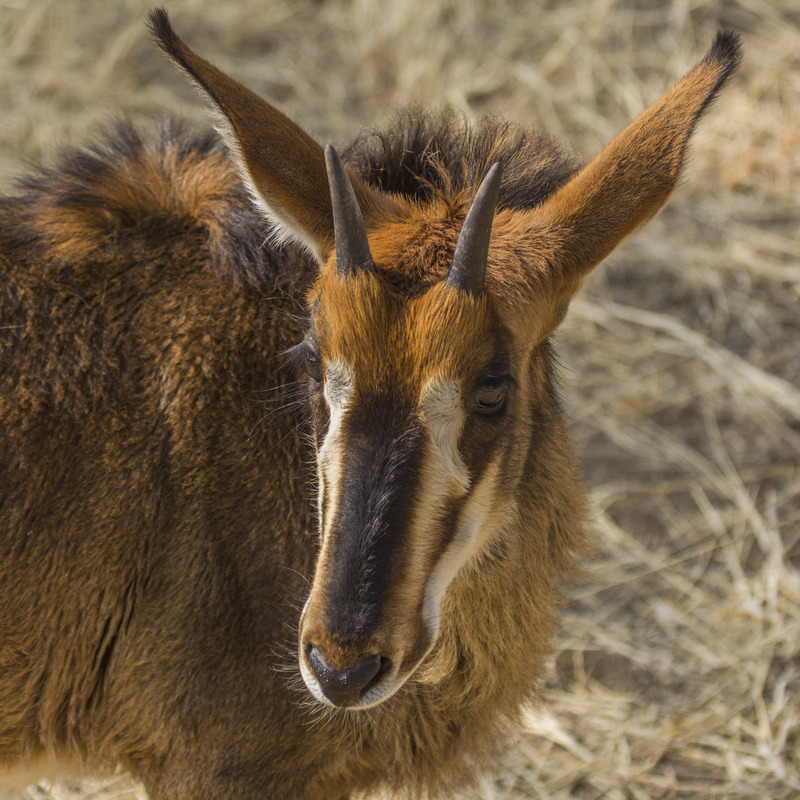 Both the males and the females have horns, but the female’s horn are shorter and straighter than the male’s. 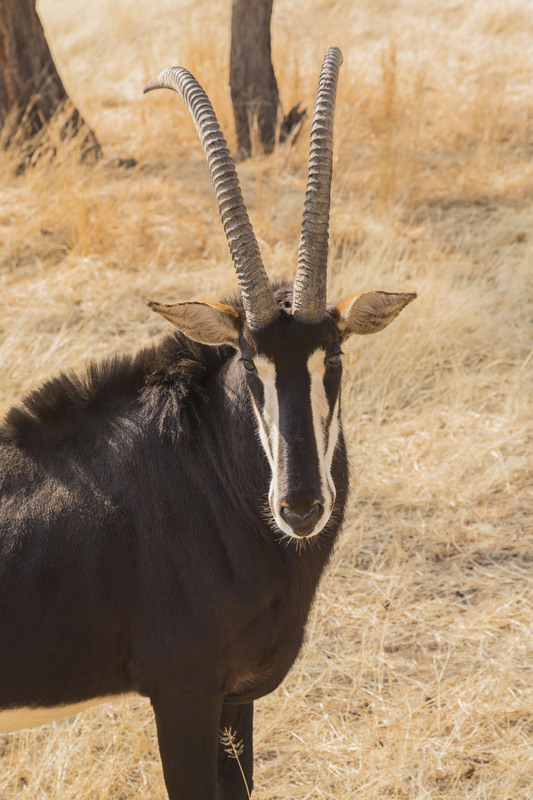 The male’s horns elegantly arch backwards and spread apart as they grow away from the head. I’ll post a profile view in a day or two so you can see how pretty they are from the side. Their horns make good weapons, especially those of the big bulls. Most lions won’t attack a full-grown sable, but they’ll go after the hornless calves. I don’t think I’d tangle with an animal with spears attached to his head either! 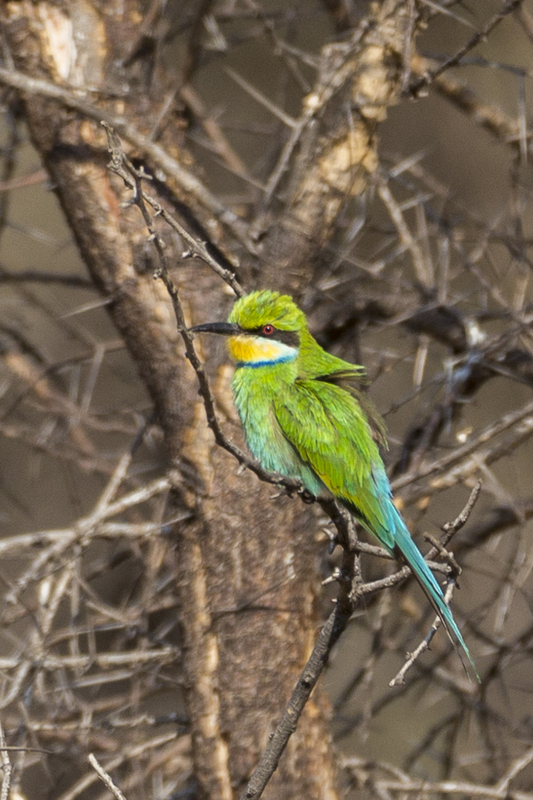 This is a swallow-tailed bee-eater (Merops hirundineus). They prefer a more wooded environment than the lilac-breasted roller featured in yesterday’s post (A High Roller, 10.19.14). The bee-eater, as you may have already guessed, eats bees. Though they’ll also eat other flying and stinging insects like wasps and hornets, they prefer honeybees, and they only catch them in flight. They have keen eyesight and are maneuverable fliers. After they catch a bee in their beak, they’ll land and brush the stinger and venom sac off by rubbing the bee on another object like a branch or a rock before consuming the insect. As with the lilac-breasted roller, the male and female swallow-tailed bee-eaters look the same.